Philippine Sea (CV-47) was laid down by the Bethlehem Steel Co., Quincy, Mass. 19 August 1944; launched 5 September 1945; sponsored by Mrs. Albert B. Chandler; and commissioned 11 May 1946, Capt. D. S. Cornwell in command. In June the ship went to Quonset Point, R. I., for initial training of the crew. By September 1946, she began her shakedown cruise in the Caribbean area with Air Group 20 embarked. Upon returning from shakedown exercises, Philippine Sea was ordered back to Boston to prepare for the Navy's Antarctic Expedition, Operation Highjump. On 29 January 1947, in the Antartic region of the South Paeifie, Rear Admiral Richard E. Byrd and his party were flown from the ship to begin their polar explorations from Little America. During the remainder of 1947, Philippine Sea operated in the Atlantic and Caribbean. In the spring of 1948, the ship was deployed to the Mediterranean to join Vice Admiral Forrest Sherman's 6th Fleet. With Air Group 9 on board, Philippine Sea showed the American ensign in France, Greece, Tunisia and Sicily. In June 1948, the huge carrier returned to the United States. During the summer, Philippine Sea was engaged in developing doctrine for carrier control approach landings, the sea going equivalent of GCA. November found her exploring the lower rim of the Arctic Circle in a cold weather operation designed to test planes, ships, and equipment. In January 1949 the ship was again ordered to the Mediterranean, with Air Group 7 embarked. Returning at the end of May the ship went immediately into overhaul at the Boston Naval Shipyard. Early autumn found the ship once more in the Caribbean, "shaking down," this time with Air Group 1. Operational development projects with jet fighters and task force exercises in the North Atlantic kept the ship and her air group busy until the end of the year. Operating again from her base at Quonset Point, Philippine Sea was employed during the winter of 1950 in qualifying carrier pilots and, for part of February and most of March, took part in extensive fleet exercises in the Atlantic and Caribbean. April and May were taken up with demonstration eruises for guests of the Secretary of the Navy, the Armed Forces Industrial College, Air War College, and the Armed Forces Staff College. On 24 May, Philippine Sea sailed from Norfolk, Va., passed through the Panama Canal, and arrived at her new homeport of San Diego, Calif., to become a welcome addition to the Pactfic Fleet. With the outbreak of war in Korea, Philippine Sea was ordered to Pearl Harbor, She sailed for Hawaiian waters on 5 July with Air Group 11 embarked. The ship departed for the forward area 24 July. Leaving Pearl Harbor, Philippine Sea sailed at full speed for the Western Pactfie, reaching Okinawa 4 August. Philippine Sea sailed into action off Korea as flagship of Task Force 77 on 5 August. She launched air strikes to rain thousands of tons of bombs, rockets, and napalm down on strategic targets. As many as 140 sorties a day were launched from the earrier. Except for time out to re-arm, refuel, or repair for brief periods, Philippine Sea was in action eontinuously. Operating with other earriers of Task Force 77, she hit North Korean rail and communication centers from Seoul to Wonsan in September. In the Yellow Sea she put on a major performance softening up the Inchon invasion coast. D-Day 15 September, found Philippine Sea planes ranging far inland to destroy any attempts by the enemy to bring up reinforcements. Following the initial assault, she continued to provide close and deep support for the thrust inland to Seoul. Two months later when the Chinese Communists surprised the United Nations ground troops with a smashing drive south down the middle of the peninsula, Philippine Sea planes dived through snow and sleet to hold back the Red hordes. Throughout the long retreat from the Yalu, the ships' Panther jets Skyraider attack bombers and Corsair fighter bombers blasted the path for the trapped Marines. Hill after hill was cleared all the way to Hungnam where Philippine Sea andother carriers of Task Force 77 sent up a virtual aerial umbrella. Hundreds of carrier planes swarmed over the tiny evacuation perimeter from which 150, 000 troops and civilians came to the sea. Putting into Yokosuka Naval Base, Japan, in late March 1951 for rest and repair, Philippine Sea exchanged Air Group 11 for Air Group 2 from Valley Forge. The same date as the transfer, 28 Mareh, Philippine Sea became flagship of Vice Admiral H. M. Martin, Commander 7th Fleet. From the Sea of Japan in April, Philippine Sea led Task Force 77 and other elements of the 7th Fleet down through the Strait of Formosa to the South China Sea. From the Formosa Strait, planes paraded over the island of Formosa in an attempt to bolster Nationalist morale. After this demonstration of strength, the force steamed back to Korea three days later, in time to lend close air support to the enbattled ground forces. Every Chinese offensive of the spring of 1951 suffered staggering losses in personnel as planes of Philippine Sea peppered the Reds with deadly fragmentation bombs. Philippine Sea returned from her operations in Korean waters and the western Pactfie to arrive at San Francisco 9 June 1951. Yard availability and operations along the West Coast continued until the ship departed from San Diego 31 Deeember. Arriving at Pearl Harbor 8 January 1952, Philippine Sea continued on to Yokosuka, Japan, arriving 20 January. Philippine Sea returned to San Diego in August 1952. Her designation was changed to CVA in October. With Carrier Air Group 9 embarked, she got underway onee more for the Far East early in Deeember 1952. Air strikes from the earrier eut Communist supply and transportation arteries. The North Korean offensive, begun at the same time the first truce overures were extended, marked the beginning of a series of "round the clock" air sorties in support of frontline UN troops. 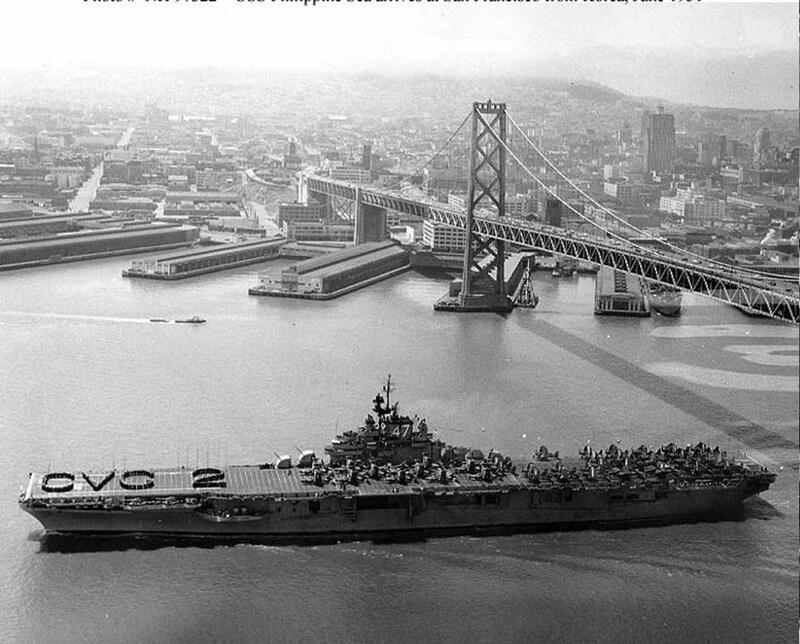 The ship arrived in Alameda Naval Air Station 14 August 1953 to off-load Air Group 9, then entered drydock at Hunter's Point for overhaul. On 9 January 1954 Philipptine Sea once more began training off the coast of San Diego. She then headed west 12 Mareh for her fourth tour in the Far East. She operated out of anile. The most significant event of the eruise occurred in late July. Communist planes had shot down a Cathay-Pacific Airways passenger liner somewhere near Hainan Island off the Chinese eoast. Philippine Sea was ordered into the area as part of a search mission with the hope that the remaining survivors might be found. While engaged in the search mission, a flight of the ship's Skyraider aircraft was attacked by two Communist fighter aircraft. Under orders to fire only If actually attacked, the Skyraiders returned the fire and shot down the Communist planes. Later this eame to be known unofficially as the "Hainan Ineident." The ship returned to San Diego, Calif., in November. Remaining in the area for four months, Philippine Sea eondueted extensive training operations off the California eoast. She began her fifth cruise of the Far East 1 April 1955 enroute Yokosuka. She operated in waters of Japan, Okinawa, and Taiwan. On 15 November she was redesignated as a CVS. She returned to San Diego 23 November. Leave, upkeep, and operations off the southern California coast and in Hawaiian waters followed and in Mareh 1957 she got underway for another WestPac tour. There for only a little over two months, she returned to San Diego and resumed local operations off the west coast in mid-summer. In January 1958 she steamed west on her last 7th Fleet deployment. Remaining six months, she returned to San Diego 15 July and commenced inactivation. Decommissioned 28 December 1958 and berthed with the Reserve Fleet at Long Beach, she was redesignated AVT-11, 15 May 1959 and struck from the Navy List 1 December 1969. Philippine Sea received nine battle stars for Korean service.